In contemporary dialogue or debates on the Russian Art of Modern Warfare, there is the fashionable use of “Hybrid War” or “Hybrid Threat” to define such friction of engagements on the battlefield. Therefore, I have created a term which I call Non-State Warfare which I feel is more appropriate to such a war state condition. This definition which I wish to employ when discussing contemporary engagements between Russia and her political advisories. the United States and its ally, NATO nations is due to the essential fact that in such a war or wars, there is no admittance of contained or small warfare that has a hidden political and social strategic goal to be achieved by another means, in this case “NON-STATE WARFARE”. It can be argued that such a war as NON-STATE WARFARE is a prerequisite kind of guerrilla urban warfare which is the first initial stage to the eventual confrontation in symmetrical warfare, or what is commonly known as conventional, modern warfare. The political struggle between nation-states like that of the class struggle inevitably is one of violent friction that is war, with all the variants of war that have been a part of human history. As Lenin wrote so judicially and without the language of false illusions about war “We Marxists differ from both the pacifists and the Anarchists in that we deem it necessary historically (from the standpoint of Marx’s dialectical materialism) to study each war separately. In history there have been numerous wars which, in spite of all the horrors, atrocities, distress and suffering that inevitably accompany alt wars, were progressive, i.e., benefited the development of mankind by helping to destroy the exceptionally harmful and reactionary institutions… Therefore, it is necessary to examine the historically specific features of precisely the present war”. i With this quote about war and its modern day development in mind, I would like to discuss or make some commentary on Captain John Chambers’ essay “An Analysis of Russia’s ‘New Generation Warfare’ and Implications for the US Army, which can be found in MODERN WAR INSTITUTE At West Point, published in October 18, 2016. 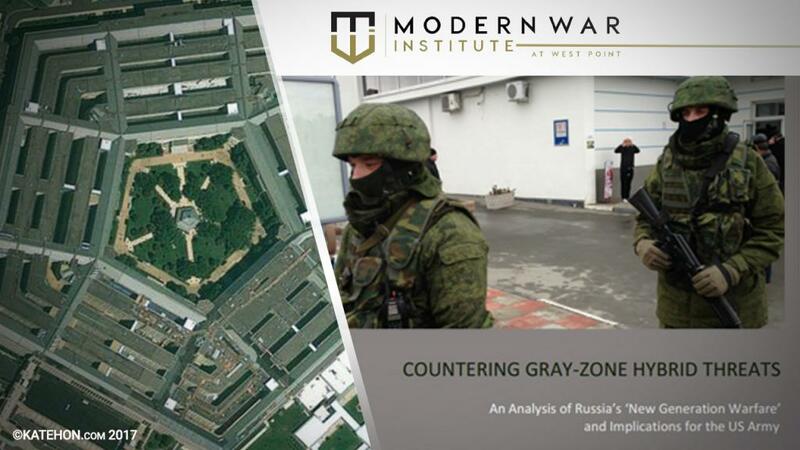 There is a curious complex among Western military science academics, particularly American military analysis about so-called “Open –Warfare Threats” verses a type of engagement called “Gray-Zone Hybrid Threats”. I would emphatically state that there is no such thing a “Gray-Zone Hybrid Threats” in the subject sense of the military term, but that all known Non-State Warfare will be a merger of tactical warfare using all kinds of tools or weapons, be they conventional or even personalized weaponry to engage the enemy in regional or internal conflicts, as well as in a civil war, not excluding revolutionary insurgency as well. In the early 21st century, there is a conscious understanding among the most astute thinkers of military theory and science, that the friction of combat between nation-states will not be always a ‘build-up to war’ in the traditional sense as we have known it, but that there is constant war in place between nation-states due to nationalistic and economic interest, since the dissolution of the Soviet Union. Secondly, the US Army should work with the Department of State and host nations to better integrate at-risk ethnic populations into the host country. These populations are at risk for subversion and coercion by gray-zone aggressors”.iii When NATO command and its US military command in Europe decided to move troops along the Polish border and to strengthen political ties and military ties with Kiev Junta, it can be argued that both parties already had a military contingency play to place their troops as either a political provocation as a bait to force the Russian Government to show its hand regarding its military preparations, or that it was in fact a pre-positioning of forces due to the political summation that Ukraine had become one of those “at-risk countries” due to the fact that the people who lived and thrived in Eastern Ukraine felt marginalized both politically and economically from the pro-Western Kiev regime. Let us also not forget that even the Obama regime admitted to having a hand in creating the pro-junta regime, even working with right-wing or fascist quasi-military groups to achieve such ends.iv What could lacking in moral substance than the fact that the United States has already been involved in so-called “Gray-Zone Hybrid Threats” in an ‘operational environment’ known as the Ukraine. Therefore, in the complicated war of political subversion there was involved two nation-states who maneuvered to control another nation-state outside their own borders. However, the question can be asked if one of these nation-states had the moral high-ground to involve itself in the affairs of Ukraine sovereignty? One can be said as a fact though certain specialized Russian armed forces did in fact create a so-called “Gray-Zone” of operational warfare, it was the people of Eastern Ukraine who revolted against the Kiev oligarch. What remains, however, is the contradiction that the people of the Donbass region are communist and socialist in their body politic and therefore they seek self-determination which is entirely different from Russian Nationalism. Because of these immense political differences, political and military leaders in Russia must understand through a studied self-criticism and a diplomatic acceptance that a pragmatic adjustment in the conflict in the Ukraine must be met, otherwise, they will have no choice but to enter into an outright invasion of the Ukraine, and such a strategic decision could play into the hands of United States adventurism with the return neo-liberalism leadership in Washington or even through impulsive and fascist betrayal by the Trump regime. The other military tactic that was mention in the West Point scenario is a tactic of subduing or eradicating ‘operational environment’ of gray-zone conflict by winning over the population, particularly ethnic minorities in such a battle area, not admitting that in essence it is a battle area, regardless of whether it be of a covert or overt friction of combat. In an objective analysis of military science, objectivity is of the utmost importance regardless of whether it falls on the side of the aggressor or those defending their homeland. Military tactics and strategy is based not only on the moral value of waging war, but also on the capability to look dispassionately at every detailed event in the course of waging war. Therefore, regarding empathy and giving economic and political support to the population and ethnic minorities in area of a friction of conflict is tactically reasonable and constructive as long as such support is based on genuine concern for the welfare of the people. The American regimes during the modern era have been successful in deploying economic aid and military aid to governments beyond their borders that they feel they can influence in their continuous war by other means against nations like the former Soviet Union. We only have to look at the Peace Corps or the pacification program during the Vietnam war to understand the kind of propaganda and intelligence war to win over populations, even if requires an extreme degree of manipulation without genuine regard for the wellbeing of those people. In many ways, the Russian military leadership can learn from the more subtle abilities that Western armies have used to bring the population over to their side, for instance in the way they supported the resistance movements in France, Yugoslavia, and even sending military missions that were to contact Chinese leadership in China and Vietnam during years of foreign occupation in those nation-states during World War II. The Russian military leadership should create schools of military training specifically for understanding the needs and aspirations of national minorities in the United States, such as the Native American tribes, the Mexican Americans who are a colonized people, and the African American people who are still subjected to racist atrocities. By understanding and showing empathy through such creative and instructive ways, meaning through even diplomatic means or friendship organizations, then such ways of communication can counter the callous and banal methodology of swaying the hearts and minds of the population as envision by the West Point instructor’s to “integrate at-risk ethnic populations”. In the undeclared world war we are now engaged in throughout the world, the forces of fanatical Islamic military armies, Western armies of imperialism and reaction, and the armies of progress like Russia which includes the Syrian Arab Army and their other allies, it is the untold war of winning the hearts and minds of the world’s masses that must be understood in the art of contemporary warfare. I would argue that violence does occur in such so-called ‘Gray Zone’ of operations but in more subdued and covert form. For instance in the Ukraine and Syria, it is well known that the United States regimes and their various allies used intelligence services as well as special forces to ignite particular classes, such as the middle and upper classes to agitate and in fact cause violence during so-called peaceful demonstrations. Such covet military manipulation in the Ukraine and Syria led to violence in the streets and eventually to armed uprisings and assassinations of publish and non-public figures. In Latin America, the United States Government has instigated such covert subtle, political maneuvers as in Chile, Argentina, to the present time in Venezuela and Ecuador. For decades regime after regime in the United States has tried the ‘Gray-Zone’ of so-called hybrid thread without complete success. What is manifested in the hypocrisy within the theoretical military theory on hybrid warfare in general by Captain Chambers is the fact what the Russian intelligence and military services are now doing overseas has already been done many times over by the United States with destructive consequences to the people of nation-states that were subjugated to so-called ‘non-violent’ conflicts. It can be argued that corporations who work on their own behalf or work in covert collusion with a nation-state also participate in ongoing forms of non-state warfare, as it is not mentioned or acknowledged even in propaganda material or in public mass media. Such ways of creating economic warfare is nothing new and is again a part of war by another means, except in the modern world it has global implications that are more hazardous and destructive due to modern technology which binds covert and overt warfare into an invisible link that has nothing to do with ‘gray-zone’ conflicts, but which can be of a robust Machiavellian nature that one can only understand years or even decades afterwards and which historians sort out through detailed scholarship. Therefore, so-called ‘gray-zone conflicts have manifestations of non-violent and violent means or tactics which is implicated in political environments where there is political and economic instability which can be manipulated into some form of political unrest leading to both covert and over military action. The genius of the Soviet Union was in the way its leadership and the Russian Communist Party was able to analyze any given nation-state situation with a calm and unnerving aptitude to forcing an enemy’s hand, and eventually defeating him. As a way to counter Russian, Chinese or even Iranian so-called hybrid wars, but which I would state is none other than engagements by non-state operations, that is sanction conflicts, but not admitted through the classical mask of Maskirovka in modern military terminology, is something that the US military leadership is constantly pursuing in its war college school and in the various, studious rooms at the Pentagon and West Point. The author of the essay “COUNTERING GRAY-ZONE HYBRID THREATS” has set out a proposal in which he states “In order to be effective in countering hybrid threats in the gray-zone, the Army must do three things: (1) adequately define hybrid threats and the gray zone; (2) identify and adapt to challenges posed by gray-zone hybrid threats due to laws, norms, and processes; and (3) improve capacity to counter gray-zone hybrid threats. These three lines of effort will effectively posture the US Army to counter gray-zone hybrid threats and achieve its strategic objectives as outlines by US defense policymakers”.vii As is well understood in both East and West, the ‘policymakers’ of the US defense are not only interested in containment of its perceived enemies, but also to expand its goal of world hegemony. What is lacking in the West Point paper is a lack of understanding that war, whether it be of a covert or overt form of engagement on and off the battlefield is one of moral and political élan and creativity that meets the needs of the people. It is not simply that one can define a so-called hybrid war of any color, shape or form. It is not enough that one can identify or even create forms of military and intelligence service tools to contain an adversary. One must develop a military theory of war based on the given nature of a nation state’s political ideology and its form of government without rationalizing about the corruption or the insidious base of the body politic of that given country. Even if one attacks another advisory’s ally which is a criminal organization or implements political networks among a given people, or creates various cultural and law norms that breakdown or impede an enemy from a given Space and Time, that does not means that the a new Time and Space will not emerge among an operation of battle, unless there is genuine respect towards one’s own political nation-state, and that others respect it as well. It is with caution about overly summarizing a perceived enemy’s aggression without looking at one’s own political and military domain, that I quote Machiavelli who stated about such conflicts as I have written about in this paper that “Therefore, a prince who has a strong city, and had not made himself odious, will not be attacked, or if anyone should attack he will only be driven off with disgrace; again, because that the affairs of this world are so changeable, it is almost impossible to keep an army a whole year in the field without being interfered with. And whoever should reply: If the people have”.viii In a world, those who lead a nation-state, even those in military leadership, should consider first their own political climate and whether it is “odious” or not among the people. At the present time in the United States it is a nation divided, a nation torn by a few hundred years of intense class and racial violence that no amount of countering ‘gray-zones’ of non-nation state can justify to a people without the spirit for engagement with any enemy perceive in reality or otherwise. In the second part of my essay, I shall purpose a concept of battle that will infect could play a role in mitigating or destroying so –called non-state warfare which in reality is a stage to none other than eventual open warfare. The art of battlefield operations, although seemingly going through revolutionary change in the 21st century, has actually become primitive and barbaric in the pursuit of creativity in the art of war. From the American Pentagon’s strategy and tactics there proceeded a form of asymmetrical warfare or a modern blitzkrieg attack battlefield formation that was first institutionalized during the Persian Gulf War and then was mutated in the Afghanistan and Iraq wars though a combination of special forces strikes and the hiring of corporate mercenary forces, as well as creating clandestine political upheaval in those nation-states though blatant political lies as, when the United States George W. Bush regime accused the Sadam regime of having weapons of mass destruction, which was not the case. The United States military also combined a methodology of war of attrition as was demonstrated in Afghanistan, and in a way it allies destroyed piece-meal through massive air strikes the infrastructure in Libya. On the other hand, he Russian art of warfare has gone through a combination of asymmetrical warfare that is wedded to massive air strikes, and has also shown an expansive refined art in warfare, as when see how it dealt with the Islamic fanatics in Syria, particularly Aleppo which has been named by some military thinkers as the “Stalingrad of Syria”. With military ground forces and systematical air strikes by modern Russian jets and bombers, Russia and the Syrian Government has been able to contest the area of Palmyra in Syria, while the Syrian Arab Army and the Russian air attacks, along with limited ground Russian troops were taking Aleppo. You cannot with one hand grab the throat of the enemy to end his life, while with the other hand allow it to fall to your side, allowing your adversary to take out his weapon again to disarm you, or end your own life. In other words, each battle situation must be measured with a political and military science of analysis, or one can have a set-back like what took place at Palmyra, when the Daesh forces re-emerged in that famous and ancient city. Regardless of the hidden strategic or diplomatic position that is occurring in Syria against the Islamic fanatics and the American imperialist with their renegade ‘moderate’ rebels, there must be consistency in completing the battle at hand. One must conclude that both adversaries have not achieved a defining modern concept of the total annihilation of the enemy, but rather have offered an asymmetrical conceit to combat operations that leave much to be desired in the ongoing procedures to achieve a dominate and deceive victory over an enemy. As military historian and a military theorist grounded from my youth in the Soviet Art of War, I believe that any participation on the battlefield should not be a cumbersome and useless participation in militarism, but instead a steady advancement in creativity that is always seeking the quickest and most decisive way towards defeating an enemy. In a word, the operations art of war is not simply an encounter or friction of mass causalities and butchery on any given battle field, but rather a deeper concept of forward and residual movement of troops and the available tools that accommodate an army in a time of war. With these thoughts in mind, an incident or euphony occurred to me during my viewing of an art exhibit of a modern French painter’s works, in which I noticed a critic’s words next to a landscape created by the painter. The critic alluded to the fact that what made the painter’s landscape and even interior paintings so unique was the way in which the foreground and background of the paintings were combined in such a way that there were no boundaries, but instead a disseverment or defusing of boundaries all together as if the landscape was one whole, organic work without linear lines, but instead a spatial of movement taking place in the whole painting which brought about a revolutionary visual movement not seen before. As I stood looking at the landscape with a calm and steady eye, I thought with a sense of imagination how modern warfare could also achieve such results in terms of movement over a battlefield with an army or specialized forces along moving forward and retreating when necessary that would breakdown the rigid barriers of exterior and interior lines of battle. In other words, Operational art as it is now understood in both East and Western military thought is that of utilizing nuclear weapons, armies, along with contemporary cyberspace warfare and drone attacks, with that of surgical fighter jet and bomber strikes which is a fixed form of war. It is this kind of cautionary build-up of warfare, even if in its initial stage it is one of a so-called hybrid war which becomes the first scenario to an eventual all-out war. What is left out of this kind of strategic or tactical thinking of warfare is a surprise of spatial warfare that does impede itself with exterior or interior lines of attack and defense. Taking a maxim from Napoleon in which he wrote or said “It should be adopted as a principle never to allow intervals through which the enemy can penetrate between the different corps forming the line of battle, unless you have laid a snare into which it is your object to draw him”ix, I would emphatically state that by dissolving the lines of battle within the time and space of operational art there ensues a more genuine creativity which is enhanced in terms of movement in advancing or retreating and even creating “a snare” that Napoleon alluded to in his commentary about “intervals” in battle of an army and open gaps. With the U.S. armed forces since the time of the Korean War, to their adventurous wars in Vietnam, Afghanistan, Iraq along with its proxy battle groups in Syria, it is has always been a commitment to operational art that was always a dogmatic art of war. The US Armed Forces uses a build-up of friction with massive air force bombings, along with what the French would call Bluffant in order to make an enemy succumb to their imperialist demands. Their generals or military thinkers never are able to conceive warfare without static lines of battle, and therefore never know the concept of “Surprise” on the battlefield. The Syrian Arab Army has shown a deeper creative insight into battle operational art that moves forwards and then retreats only when necessary, but has also shown how to merge into a spatial like dissolvent of no fix battle lines, as when they fought in Aleppo against the Jeish al-Fatah (formerly Al-Nusra)and divisions which were made-up of division or brigade rebel groups that eventually became nothing but proxy battle formations for America and her allies’ political and economic interests. When I say “no fixed battle lines”, I do not mean the kind of dissolving of fixed battle boundaries in operational art that I advocate. The Syrian Arab Army improved on breaking out of traditional forms of modern battle in their victory at Aleppo which did not rely on fashionable ‘hybrid’ warfare which is superfluous in nature, for it never completes the object of war which is to destroy the enemy through piece-meal destruction or through rapid and non-negotiable war of annihilation. Thus it is my contention that the art of war have no fixed boundaries in battle formation in the modern art of war so as to create many multiple forms of attacks and withdrawals, but always with the strategic intention of annihilation of the enemy. PSOE: Crisis, Monstrosity, and "Hybrid Warfare"